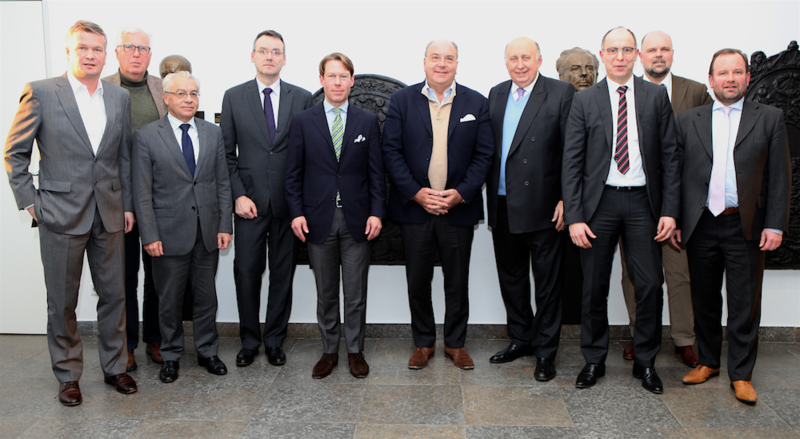 The newly elected EUROMETAL Presidency met for the first time in Düsseldorf on 19. January 2016 under the chairmanship of EUROMETAL president, Jens Lauber, CEO TATA Steel Distribution Mainland Europe. First Vice president Robert Kay, FERONA, Czech Republic, Vice-presidents Mikael Nyquist, TIBNOR, Sweden, Johan Rosseel, GRYMAFER, Belgium, Cesare Vigano, AMCLN, Italy and Presidency board members Oliver Ellermann, BDS, Germany, Roberto Gonzalez, TIRSO Group, Spain, Michel Julien-Vauzelle, FFDM, France, Alexander Julius, MACROMETAL, Germany, Norbert Thumfart, ARGE SMD, Austria and Hein Vandeveire, AMDS SSC West Europe, Luxembourg. Commenting the Presidency meeting, EUROMETAL president Jens Lauber underlined that EUROMETAL is an international platform for European steel distribution, SSC and steel trade, which are today 6 000 companies having shipments of 77 million tons, serving more than one million customers of steel, tubes and metal products and giving jobs to 110 000 people in the European Union. The core member base of EUROMETAL is constituted by 19 national federations representing steel distribution and SSC, added the EUROMETAL president in his comment. Jens Lauber pointed out to the facts that EUROMETAL represents more than half of all volumes channeled to the European steel consumers and that about 90% of the companies of the steel distribution sector are typically small and medium sized enterprises. Commenting the geographical reach of EUROMETAL, Robert Kay, EUROMETAL First Vice-president, expressed his satisfaction about the acceptance of EUROMETAL as an outstanding provider of market intelligence and research reports leading to a strengthening of EUROMETAL’s visibility in Central and South-Eastern Europe. After extending its reach to Estonia, EUROMETAL is pleased to announce that Slovenian group KOVINTRADE has recently joined the ranks of EUROMETAL. KOVINTRADE is an international network of steel trade and distribution companies having subsidiaries and agencies in 13 European countries.